Beverly Hills, CA – Teenagers have an uphill battle during adolescence. Many of them suffer through all of the teen woes, such as acne and body image issues. It’s certainly not the easiest time of life. While it may seem that there isn’t much you can do during this time except for hold on and hope for the best, there’s actually a way to make it a little easier – Invisalign Teen. As most parents know, the pre-teen and teenage years are the best times for orthodontic care. The mouth hasn’t completely developed, so it makes it easier to move the jaw and teeth for alignment. This means treatment time can be shorter and easier than waiting until adulthood. However, with appearance meaning so much during adolescence, many teens shun metal braces. They may already be dealing with the side effects of puberty. Now they have to add metal wires and brackets to their smiles? It’s understandable why most teens would be unhappy with this treatment option, especially when going back to school. Luckily, Invisalign teen allows your teen to achieve a beautiful smile without resorting to all the metal that comes with traditional braces. 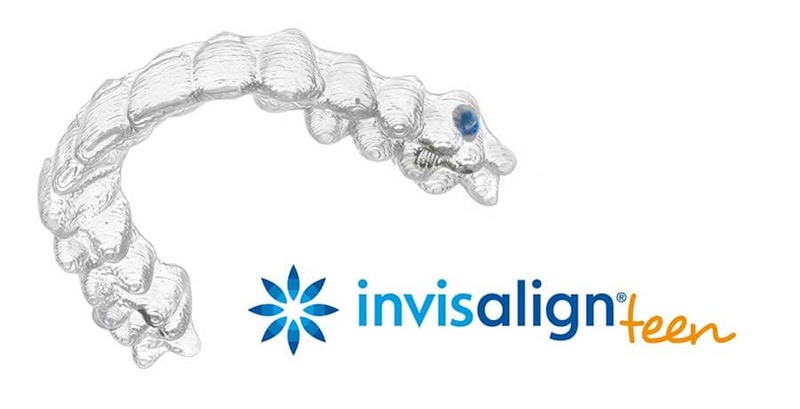 Invisalign Teen is a set of clear aligners that fit snuggly into the mouth. The treatment is nearly invisible and can be just as effective as traditional braces for certain bite issues. What’s great is that, unlike braces, the aligners are completely removable. This is perfect for giving kids the confidence they need in school while also straightening their smiles! Invisalign can be removed while eating, brushing/flossing teeth, and during sports activities, but they must remain in the mouth for at least 20-22 hours a day in order to be fully-effective. Many orthodontists used to be concerned with the level of responsibility teenagers would need to have to make Invisalign treatment successful. This is no longer the case. Parents and teens are encouraged to work together in order to commit to wearing the Invisalign Teen aligners for as long as possible. By involving the parents, Invisalign treatment time should take around 12-18 months. If you suspect that your teenager needs braces, contact Los Angeles orthodontist Dr. Atoosa Nikaeen. Dr. Nikaeen specializes in helping young adults improve their smiles while keeping their confidence intact with Invisalign Teen. Call today for a consultation to learn more about the benefits of Invisalign Teen. 310-444-1113.